This Socialist Academic Profle looks at Dr Paul Harris, a senior lecturer in the Centre for Trade Union Studies at Waikato University. According to their web page, "People who have taken Labour Studies have found employment in both the private and public sector in areas such as human resource management, policy analysis, labour market research, journalism, employment relations advocacy and research, union organising, and research." This school is basically a taxpayer funded school for socialist activists. Every staff member I have researched so far, is a Marxist. Dr Paul Harris has a B.A. from Exeter and an M.A. and PhD from Lanc. He is the Sociology rep in the Waikato branch of the Association of University Staff. Like many of his comrades, Harris protested the '81 Springbok Tour. As a 36 year old research officer he was one of 16 protesters, discharged without conviction, after an anti tour protest in Gisborne. In the late '80s, Harris was an official with the Service Workers Union in Wellington and a member of the Labour Party. He was also writing regular articles for "Tribune" and "Socialist Politics", both organs of the pro Soviet, Socialist Unity Party. In June 1989 he wrote in "Tribune" on the French Revolution, comparing it with the Russian revolution. He had a very strange perspective on the changes then sweeping Eastern Europe "Hopefully, the current democratisation process in the USSR, Hungary and Poland, will enable the Socialist nations to succeed. Advance, citizens!" He was also involved in trade union environmental issues: Harris wrote a report for the PSA on the effects of 245T. He also wrote PSA submissions on nuclear power. Harris was the CTU rep on a sub-cttee feeding into the Natural Resources Law Management Review. In March 1990 Harris wrote an article in "Tribune" "Should Socialists Support Labour?". He concluded that they should and stated they should ignore the New labour Party and the Communist party. The SUP line to a "T". 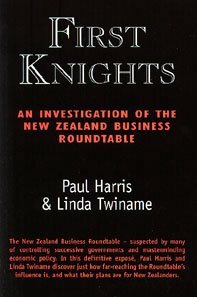 In August 1990 Harris wrote an article in "Tribune", criticising the Business Roundtable. He was to follow this up a few years later with a book, "First Knights"exposing the Roundtable's allegedly numerous faulty theories. In January 1991 Harris wrote a piece for "Tribune", "Goodbye, Cruel Lady" on the fall of Lady Thatcher. In the same issue he said "I don't need to prove my well-established Marxist background to anyone". In April 1991 he penned for "Tribune" "Health and the Individual". He wrote "The opportunities for broad-based coalitions against all forms of the individualisation of health services are excellent, and we need to take them." In the early '90s, Harris left unionism to lecture at Waikato University's Centre for Labour and Trade Union studies. He kept active with the Electoral Reform Coalition in Hamilton, strongly pushing the SUP line on proportional representation. Harris has also actively pushed the Public Service Association's "Partnership for Quality" strategy. PFQ is the latest reincarnation of the SUP's "Trade Union Compact" plan of the late '80s and their "Workplace Reform" programme of the early '90s. Its basic aim, is to give unions significant power in indusrial enterprises and government departments, by offering employers considerable concessions. At a 2001 PSA conference on "PQF" Paul Harris beseeched the conference to build the partnership culture: "So that it seeps through every aspect in life." Harris'research interests include critical analysis of market liberalism, the changing nature of work and employment, globalisation and contemporary sociological theory. You'll be glad to know that he is available to supervise graduate students in any area of labour studies and in a broad range of social and sociological issues. Centre for Trade Union Studies?! In the interests of free speech and open debate, I would appreciated the opportunity to respond to this rather personal and in places mistaken blog on me. John Minto, New Communi.. Columnist for "Press"
Who's the Drier of the Two?